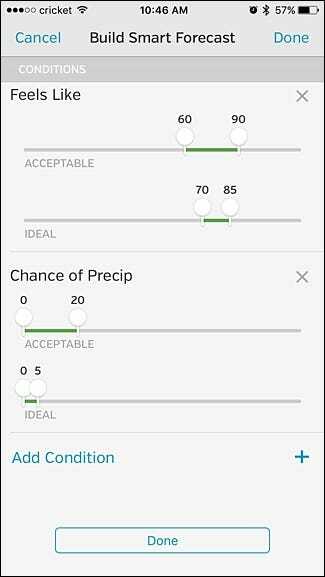 If you want to know when the perfect time would be to go for a nice stroll around the neighborhood, you can use Weather Underground’s Smart Forecasts (iPhone only). 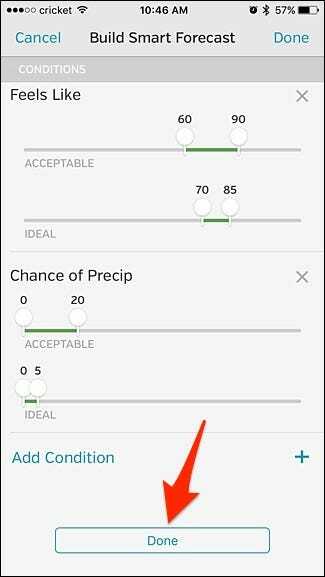 This feature lets you put together a list of ideal weather conditions, and it will show you the times throughout the day that those conditions will be met. Here’s how to set it up. Of course, you could just look outside and decide for yourself if it’s a nice time to go for a walk, but if you’re curious about the conditions later in the day, Smart Forecasts will let you know when the perfect time will be. 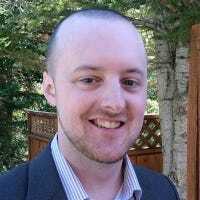 Plus, you can have it take into account different factors like wind speed and humidity. 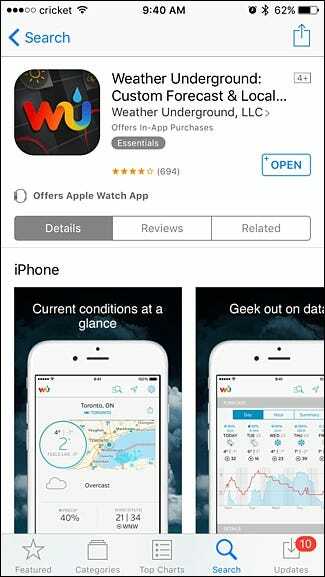 To start, download the Weather Underground app if you don’t have it already. 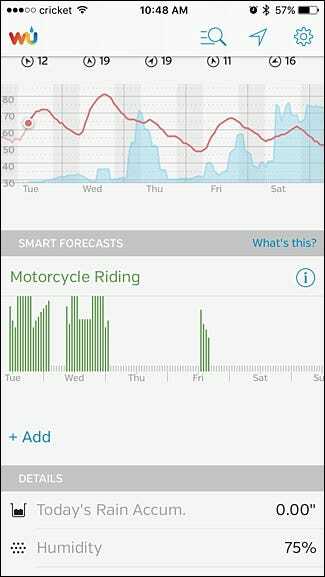 Open up the app and scroll down until you reach the “Smart Forecasts” section. If you scroll to the right, you’ll see a handful of outdoor activities. 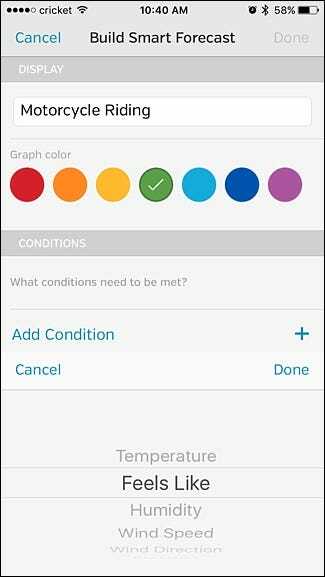 Select one for the activity that you want, or tap on “Create Your Own”, which is what I’m going to do for total customization. 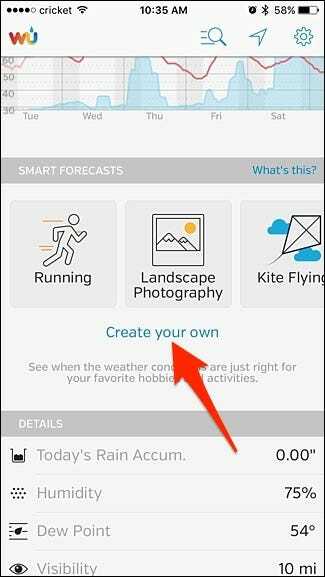 Start off by giving the Smart Forecast a name. 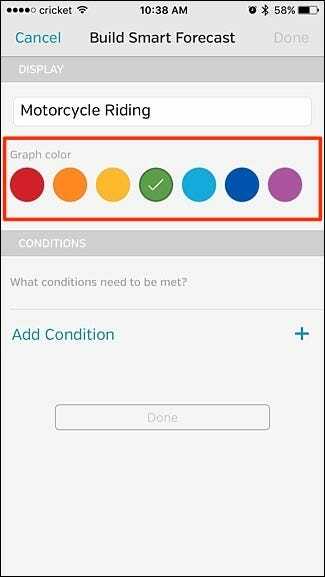 Next, select a color that you want the graph to be. 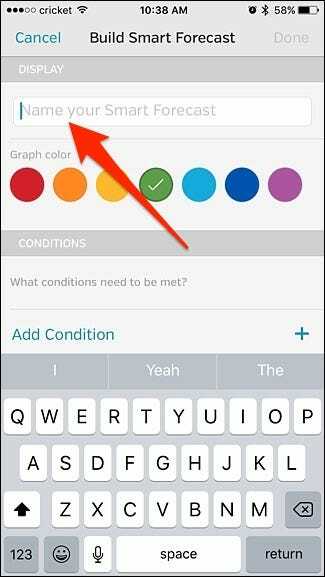 Below that, tap on “Add Condition”. 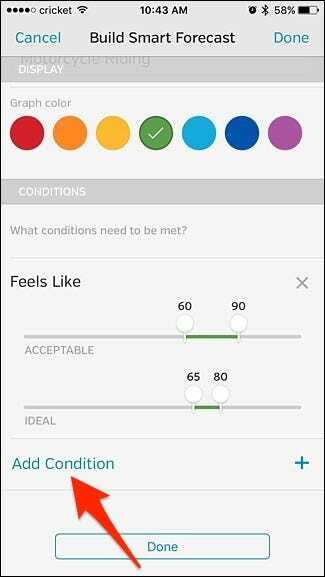 You can select from a handful of different weather conditions that would factor in your decision to do your outdoor activity. I’m going to start off with “Feels Like” instead of “Temperature”, since that’s a little more accurate—the humidity during the summer can make it feel way hotter than what the temperature says. Next, drag the four sliders to the desired temperature. 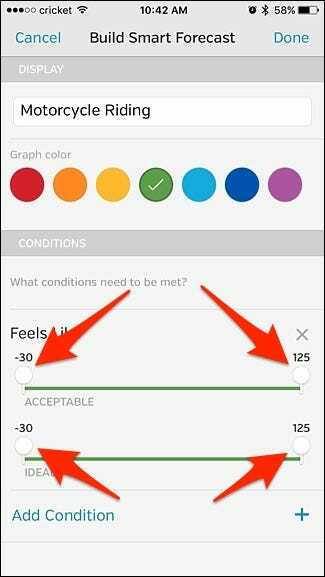 You’ll set an “Acceptable” temperature range and an “Ideal” range. 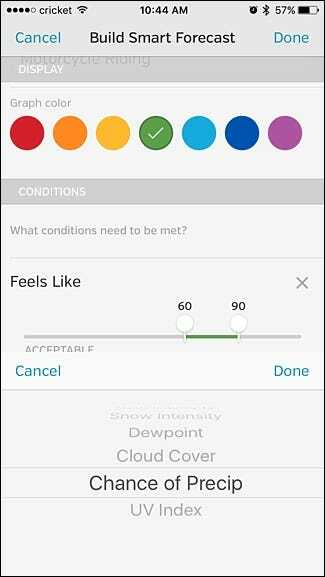 Once that’s set, tap on “Add Condition” to add another weather condition that will play a factor in your outdoor activity. This time, I’m going to select “Chance of Precipitation”, but feel free to select whichever one you want. Again, use the sliders to set the acceptable and ideal ranges. 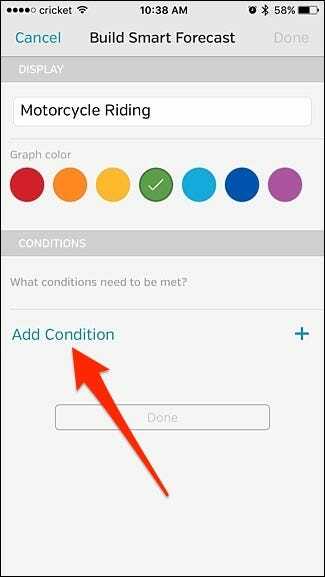 After that, you can continue to add more conditions if you want. Once you’re finished, tap “Done” at the bottom. 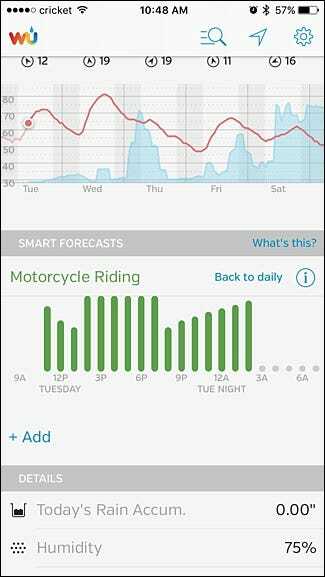 Your new Smart Forecast will appear in the app, with colored bars indicating when the best times would be for your outdoor activity. The higher the bar is, the more ideal the weather conditions will be for you, based on what information you provided. Tap on a day throughout the week to get a closer look over what the next 24 hours will look like. 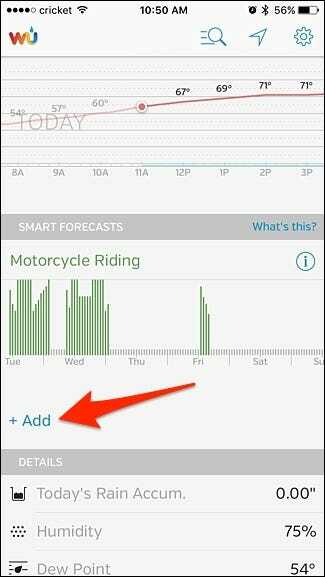 To add another Smart Forecast, simply tap on “Add” below the one you just created. Over time you may want to fine tune your Smart Forecasts, especially as the seasons change, but they can be a great way to quickly find out whether you’re a go or no-go for your favorite outdoor activities.